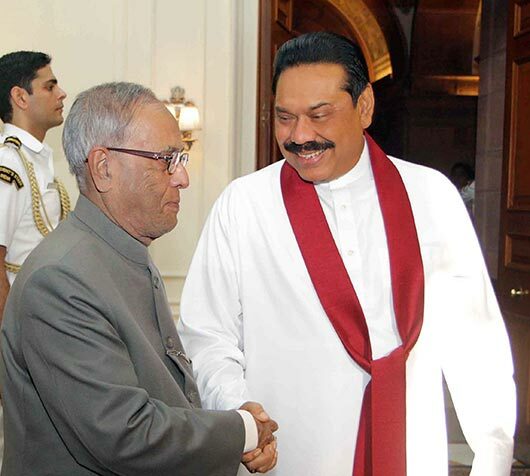 President Mahinda Rajapaksa has called on his Indian counterpart, President Pranab Mukherjee at Rashtrapathi Bhavan on Thursday evening. 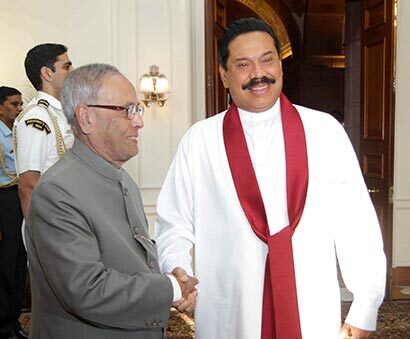 The president and the Sri Lankan delegation were warmly welcomed by the Indian president. President Rajapaksa held a special meeting with the top Indian leadership. They discussed many key bilateral issues, including South Indian fishermen. India pressed for an expeditious inclusive solution to the ethnic issue and rehabilitation of displaced people. However the two leaders paid profound attention on strengthening bilateral ties between the two nations. The Indian president hailed the rehabilitation and resettlement process and economic growth marked by Sri Lanka. He also praised that massive development activities taking place in the Northern and Eastern provinces. The Indian president noted that de-mining 90 percent of vulnerable lands in war hit areas and completing resettlement process successfully are major achievements of the government of Sri Lanka in a very short period of time. In the backdrop of the recent attacks against Sri Lankans in Tamil Nadu, the Sri Lankan leader, during his meeting with President Mukherjee, also noted that such unfortunate incidents should not be allowed to harm centuries old ties between the two countries. The president also thanked the Indian government for extending helping hand to expedite the country’s development initiatives. Minister of External Affairs Prof. G.L Peiris, Parliamentarian Sajin Vaas Gunewardena, Secretary to the President Lalith Weerathunga, Sri Lankan High Commissioner in India Prasad Kariyawasam and Secretary to the External Affairs Ministry, Karunathilaka Amunugama were also present at the occasion.